In addition to protecting your home from the elements, the right type of roofing can help reduce the effect of heat islands. 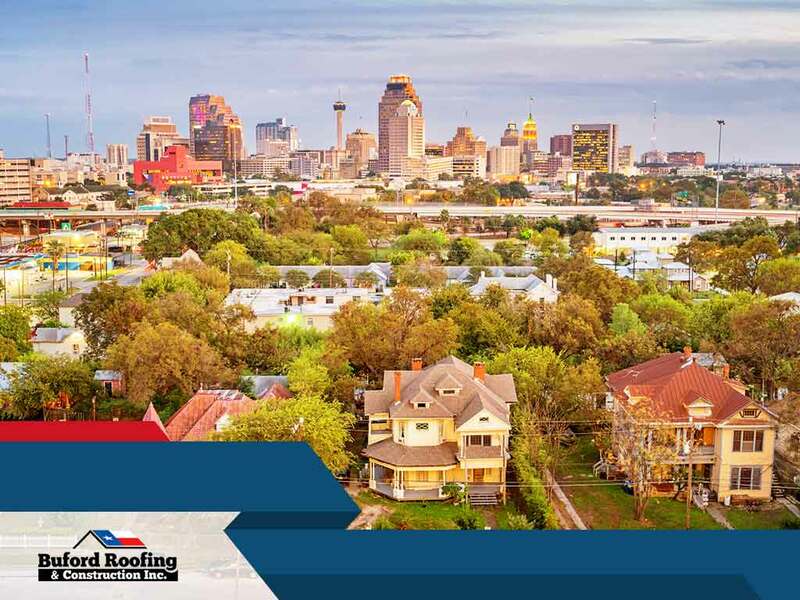 In today’s post, Buford Roofing explains what a heat island is and explains how your next roof replacement can help mitigate its effects. A heat island occurs when an area’s overall temperature is significantly higher than its surroundings. Heat islands are common in urban areas because of large heat-retaining areas but can also form in residential areas, albeit to a lesser degree. Homes and establishments with non-reflective roofs and roads paved with asphalt contribute to raising the area’s surface temperature, forming an “island” made of radiant heat. An area suffering from the heat island effect would be uncomfortably warm at the curb, even at night. Homes with inadequate exterior wall and roofing insulation and/or fitted with leaky windows feel its effects the most, leading to increased indoor cooling requirements. The HVAC system has to pump out more cool air to compensate, which results in higher energy bills. Cool roofs keep your home cool the same way wearing a light-colored shirt keeps you more comfortable when you’re in the sun on a hot day. This is because light-colored surfaces reflect a significant portion of sunlight including infrared rays, the source of heat from the sun. This is one reason why many commercial properties now feature white roofs. Even without special reflective properties, a white roof has enough reflectivity to reduce the heat absorbed through the roof. If enough homes in your area have cool roofs, the heat island effect can be significantly reduced. The challenge with cool roofs is that light-colored or bare metal roofing isn’t as attractive dark roofs. But thanks to manufacturers like GAF and TAMKO®, you can choose from a wider selection of roof colors including darker hues and still enjoy the benefits of a cool roof. GAF offers Timberline® Cool Series and Reflector Series™ shingles, while TAMKO offers Elite Glass-Seal® three-tab shingles and Heritage® series laminated asphalt shingles. All these products have received certification from ENERGY STAR® for energy efficiency. Buford Roofing is your number one general contractor for all your cool roofing needs. Give us a call at (817) 754-6555 or fill out our contact form. We serve clients in Grapevine and Flower Mound, TX.